Before learning how to draw clothes: some fun facts before starting sketching! Levi Strauss invented jeans in the 1880s. 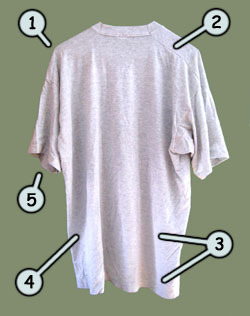 Some believe that American soldiers invented the t-shirt in WWII. It's hard to say who invented shoes. They rather evolved over time. Not all characters walk around naked! That's why it's important to know how to draw cartoon clothes properly. On the picture to your left, we can see a shirt hanging freely in space. We can see that the top of the shirt (1)(2) is rather flat while the bottom (3)(4) looks more like a big wave. Whether you're drawing a shirt or a dress, chances are that you will use this pattern very often. This one is special because we don't really see shapes in our picture. It's just a bunch of curves and straight lines. The curves are used to draw the bottom of the shirt (or any other piece of clothing) while the straight lines will be at the top (only a few of them). It's useless to sketch tons and tons of lines to represent your clothes. Keep it simple. 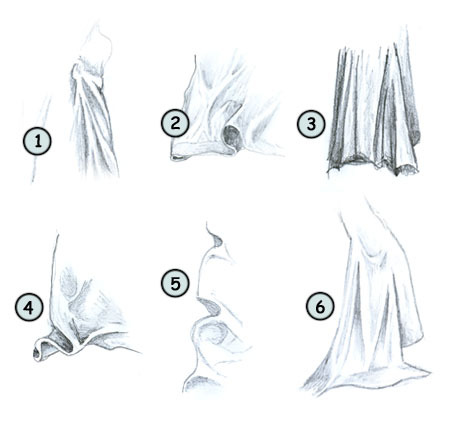 You will practice yourself by drawing the bottom of a dress. First, sketch the outline of the cloth. Then, go for the most obvious lines inside the dress. Don't hesitate to use ticker lines for long fold. Color is really important to help reading the picture accurately. Using different tones of color to create shades and light effects is crucial if you would like to know how to draw realistic clothes. Once again, look around yourself. You will find many objects ready to serve as subjects! Start by drawing only some part of a piece of clothing then go for the big picture. It's not easy to draw clothes that look real or natural. Observe and practice. That's the key!